Ready go to on a world adventure in our new match 3 puzzle game?! As you travel the cities of the world on an epic adventure you’ll solve relaxing match 3 puzzles, rescue cute creatures, collect rare treasures, collect stunning HD artwork and much more! There’s endless hours of fun content for all match 3 lovers! ⦁ Unlock HD City Quest artwork – it’s yours to keep! We’ve got hundreds of relaxing puzzles to solve for lovers of match 3 games! 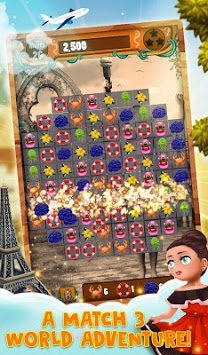 The gameplay is very simple – just match 3 or more tiles with the same picture to clear them from the board and earn points. Complete the objectives on the level to win! With no time limits, this is the ultimate casual match 3 experience, suitable for all ages and skill levels! Just sit back, take your time and have some tile matching fun! Match more than 3 tiles at the same time to create a special tile. Use bombs to clear entire rows or rainbow tiles to clear a particular set of tiles from the board completely – discover even more as you play and match as many tiles as possible in one move. 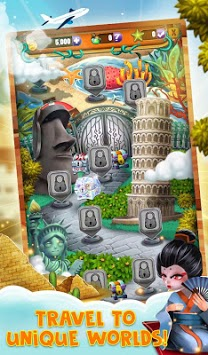 Combine different special tiles for crazy effects and to get the highest scores! At Match 3 World Adventure: City Quest we love giving out free coins and prizes! You’ll receive huge daily rewards just for logging in, so make sure to keep checking back for the freebies. After you complete a level, you’ll be able to open a mystery chest containing collectibles, coins and more. There’s even a magic coin globe which fills up over time, all you need to do is empty it! Match 3 World Adventure: City Quest is a fun, casual tile matching game suitable for players of all ages and skill levels! You can play with or without an internet connection and take the puzzles with you anywhere. With tons of content and more added regularly, the fun never stops! 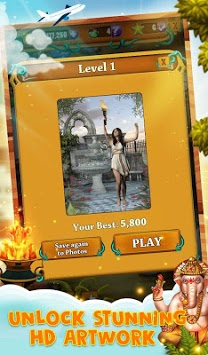 TRAVEL THE WORLD ON A MATCH 3 ADVENTURE – DOWNLOAD FREE TODAY! New 3rd and 4th Jigsaw to complete! Added a new map with 20 additional levels to explore x 4 updates, one every few weeks. Our first release of Match 3 World Aventure - City Quest! Stay tuned for new levels and features coming soon!